Peter Marralwanga lived at the remote outstation of Marrkolidjban, in western Arnhem Land and began painting the X-ray style typical of the region before transferring his ceremonial knowledge on to barks in the early 1970’s. In this endeavor he was tutored by the greatest bark painter of his generation, Yirawala with whom he shared a close friendship. While his use of the cross-hatched designs pertaining to the sacred Mardayin ceremony was attributed to Yirawala’s influence, Marralwanga’s innovative rarrk techniques empowered the finest of the next generation of artists, such as John Mawurndjul and his own sons Ivan Namirrkki and Samuel Namunjdja who continue experimentation and invention in their works. Maralwanga’s technique however, differed from these younger artists, particularly John Mawurndjul, who allows rarrk designs to drive his work into pure abstraction with his compositions always centered upon figurative depictions to which the rarrk designs remain subservient. Maralwanga’s genius lay in the way in which he trespassed the formal convention of the rarrk’s colour sequencing and orientation in order to illuminate, to its utmost, the flow and movement of the figure. In this way Marralwanga developed a distinct visual aesthetic and interpretation, while remaining true to the deeper meaning of his imagery. Marralwanga’s scope of subjects was diverse and revealed his profound and deeply spiritual knowledge. Depictions of the giant creator spirit Luma Luma, the central figure of the Mardyin ceremony were for instance, adorned with complex rarrk designs evoking its power to transform upon death into the sacred objects. And in images of Yingara, the Rainbow serpent, the weed in the waterholes becomes the hair of his second born daughter, the mermaid-like Ngalkunburruyayami, while the vines growing in the nearby tress are the feathered strings she and his son, Ngalyod, carried. The bark painting depicted here was created in 1980 and is typical of the period. The crocodile and goanna fill the entire surface of the bark and overlap in a way that is just a fraction short of abstraction. It is possible to look upon this painting as a stylistic bridge between traditional western Arnhem Land painting of the past and the strikingly patterned works being created by his descendents today in Maningrida and Yirrkala. Marralwanga created paintings for close to 20 years and during that time institutions collected many of his finest works. He began painting prior to any art centres in Arnhem Land and sold works to Dorothy Bennett, Jim Davidson and others who infrequently visited his outstation on buying trips. He became an active member of Maningrida Arts and Culture upon its establishment in the late 1960’s and, in the absence of all but a few private galleries, it was through the Government marketing company, Aboriginal Arts and Crafts, that he gained recognition as it opened galleries in each of the State capitals between 1970 and 1987. His success rate at auction is a very healthy 75% although his best year was as long ago as 1999, the year his record sale was achieved for Untitled (Saltwater Crocodile) c. 1972. The large bark measuring 210 x 90 cm, sold for $21,850 at Sotheby's in June of that year against a presale estimate of $15,000-25,000 (Lot 15). The painting was of exquisite beauty and detail, with shades of purple ochre unique to Marralwanga’s country. Though it is characteristic of his style in its diverse arrangement of the clan design that illuminates the rotund crocodile in motion, its age and subject sets it apart from many of his other works. A white figure sits above the figure of the Crocodile lying on a vast plain background, and this clearly resembles an artifact of some ethnographic importance. In contrast works such as Mimih Spirit Dancing at Catfish Ceremony 1979 were distinctive for their innovative pattern and intricacy, This work sold for a considerable $13,200 at Sotheby’s in July 2005 when estimated at $10,000-15,000 (Lot 56). And in November 2006, despite an estimate of just $3,000-4,000 a magnificent Lorrkon, Hollow Log Coffin, c. 1977 sold for $10,200, and became his highest priced sculpture to date. (Lot 83). Peter Marralwanga was a truly great painter who lived and died before Aboriginal art gained its current national and International prominence. 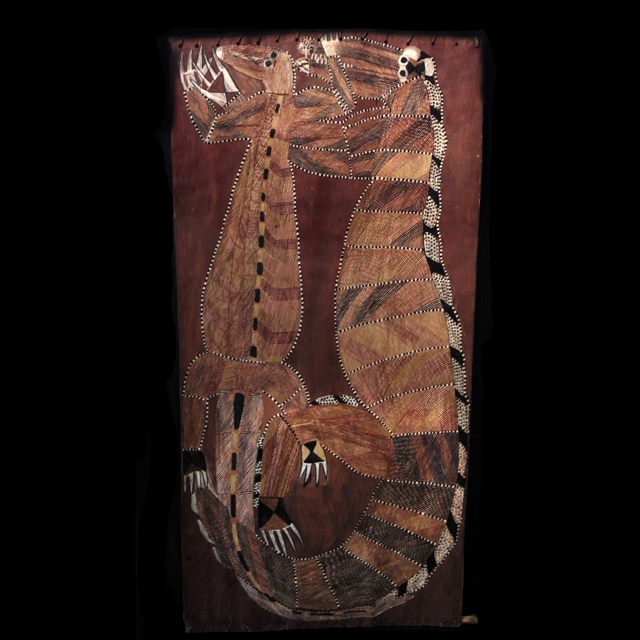 In 1981 and 1983 he had solo exhibitions with Mary Macha at Aboriginal Traditional Arts in Perth and at the time was second only in recognition to his lifelong friend and countryman Yirawala as the most influential Kuninjku artists of their generation. His works were included in the important landmark exhibitions A Myriad of Dreaming: Twentieth Century Aboriginal Art in 1989, Aboriginal Art and Spirituality in 1991 and Crossing Country - the Alchemy of Western Arnhem Land Art in 2004 at the Art Gallery of New South Wales.